When one thinks of birds, probably, the first thought to enter one’s mind is the power of flight. With their streamlined bodies and long pointed wings, one group of birds stands out in this regard – the swallows. Seven different kinds of swallows occur in Saskatchewan, one of which is uncommon. In town, the most common, and our largest swallow, is the Purple Martin. It is highly migratory nesting as far north as the Northwest Territories and wintering in the jungles of Brazil. Migration occurs at night; daytime is spent resting and feeding. There are few things as pleasant as waking up in the morning in late April or early May to the chortling and gurgling sounds of newly arrived Purple Martins. Nesting starts immediately. Martins are unique in that their nesting season is so variable, with the colony leaving when the young are capable of long flights, which can occur as soon as the middle of July or as late as the beginning of September. One morning the Martins are gone, and suddenly, one’s yard seems eerily silent. Last year, the colony in our yard left on the tenth of July, while other colonies in town were still around towards the end of August! Whether they migrate south or merely hang around other local areas until fall comes is still uncertain. As the name implies, Purple Martins (males only) give off purplish reflections when exposed to good light, otherwise they appear black. The females are paler with whitish under parts. Why the name martin and not swallow? In Europe, only swallows with deeply forked tails (swallow tailed) are called swallows, all others are called martins. The name has stuck to only one of our swallows, the Purple Martin. Perhaps, a more accurate name would have been “Black Swallow”. All swallows have wide gaping mouths with which to catch insects while in flight. Because of this, they spend a great deal of time on the wing. For many years, Purple Martins have been (and still are) touted as great consumers of mosquitoes, to which end many people have been trying to entice them to nest in their yards. Recently, it has become more and more evident that Purple Martins do not consume many mosquitoes at all – at least not enough to make a dent in one’s backyard mosquito population. Flight takes a lot of energy, and the bigger the bird the more energy it takes. A mosquito is simply too small to provide enough energy for a bird the size of a Purple Martin to chase and catch it – especially, when feeding young. It is a basic tenet in the animal world that “the bigger the predator; the bigger the prey”. Swallows are no exception. Smaller swallows will and do eat many mosquitoes; Purple Martins will eat some mosquitoes, but usually select larger insects like moths and dragonflies. Of all the birds native to the new world, the Purple Martin has the longest direct association with man. When Europeans first arrived in the late 1400s and early 1500s, Native Americans of the American Southwest were already attracting Purple Martins to their villages by providing suitable nesting sites. Unlike the elaborate multi-room birdhouses of today, their houses were suspended gourds with holes cut into the sides. Because Martins are social, they will nest in colonies, if the opportunity comes along. Therefore, Native Americans would hang several gourds in order to attract several families of Martins. Outside of these man-made sources, Martins had to rely on old woodpecker holes for nesting sites. As one can imagine, Martins never were numerous, and until the latter half of the twentieth century were uncommon in Canada and rare in Saskatchewan. All that changed when man started to put out multi-roomed birdhouses. With the arrival of Europeans came another change, the introduction of the House Sparrow. Like the Purple martin it, too, is a social nester and readily shares multi-room birdhouses with the Martins. Outside the odd squabble, they seem to get along quite well. 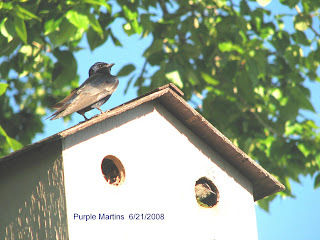 Presently, Purple Martins are very common around town as are House sparrows. If at all possible, take your binoculars (or borrow a pair) and observe a nesting colony. Notice how they greet one another upon arrival of an incoming bird. Especially, note what they bring in as food for their young. Listen to their vocalizations. Watch how they interact with House sparrows. At times they appear almost human in the way they seem to exhibit emotion such as happiness and displeasure!